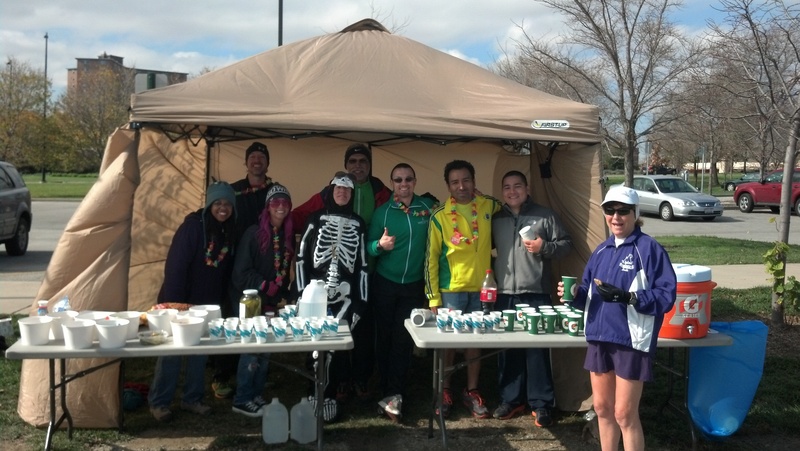 Some of the New Leaf Ultra Runs crew manning the 39th Street Aid Station at the Chicago Lakefront 50K/50M Race, October 27, 2012. Most people who know me well wouldn’t flinch at describing me as a “loner”. I grew up with six sisters, and, as the only boy, I spent a lot of time doing my own thing. Not much has changed. In fact, I learned early on in life that I have a transient, vagabond spirit. Rather than fight it, I’ve just always learned to embrace that persona, even if it means enduring losses along the way. This default demeanor has been a comforting crutch for the hours and hours I tend to spend in my own head, running roads, traversing trail. But this mentality does not take away from my basic human desire to be a part of something — to be a part of a community greater than any one individual. For most of my life I’ve been wandering, looking for that elusively small section of the planet that would make me whole. As a runner, I have finally found it. I am a part of something — something so great and so inspirational that it makes living every day as much a joy as it is an adventure.